Got questions about medical marijuana? Join the conversation at noon! The electronic latch released with a click and Corey Hewitt opened the door onto a searingly bright room filled wall to wall with rows of lush, green marijuana plants. “This is not Cheech and Chong’s garage,” said Hewitt, who is in charge of the growing, manufacturing and sale of medical marijuana to patients for Columbia Care New York. This is the bloom room, where plants spend a couple of months producing robust buds that will be harvested and crushed to extract oil that is turned into medicine. Scientists with degrees in fields such as biology, botany, biomedical engineering, forestry, chemistry and packaging science oversee each step. Until now, seeing how they do it has been like trying to peer through the impenetrable brick of the building itself: The hulking Building 12 at Eastman Business Park that houses cultivation and manufacturing operations. Columbia Care is among 10 companies — and one of the original five — licensed by New York state to make and sell medical marijuana. Each company is allowed one manufacturing facility and four dispensaries. The company is licensed in 12 jurisdictions around the nation. Because THC, the psychotropic compound that gives the feeling of euphoria, is illegal at the federal level, the product can’t cross state lines. So the company has multiple manufacturing sites. 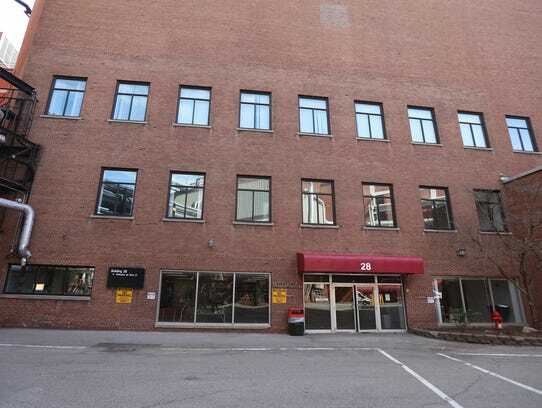 The Columbia Care facility at Eastman Business Park makes all the products for its dispensary at Building 28 (Theater on the Ridge) and for its other dispensaries in Manhattan and Riverhead on Long Island, and the one it is opening in Brooklyn. Columbia Care had allowed media to see the dispensary when it opened, and I’d written numerous stories about the company. Over the past two years, I’d asked several times to see the manufacturing side. 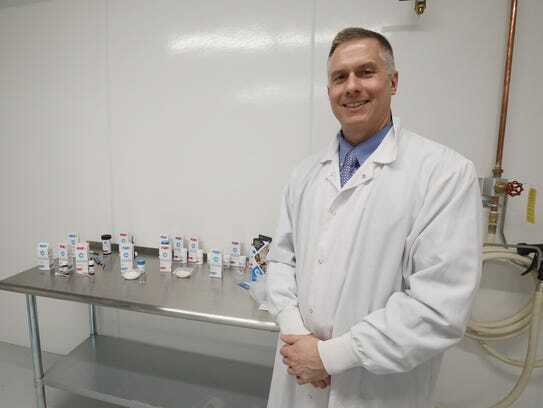 Columbia Care received permission from the state Department of health, which regulates every aspect of medical marijuana, to provide a tour exclusively to the Democrat and Chronicle. Hewitt said that based on the increased number of people certified to use medical marijuana in New York and also Columbia Care’s own growth, the time was right to show what goes on. The elevator door opened onto a hallway and a smell hit me. I sniffed. It didn’t smell that fresh in the relatively stagnant air of the industrial corridor. A little like old oregano, a little acrid like a skunk wandered by a while ago. He said you can’t get high from just being around the plants, so if I thought I was feeling their effect, it would be my imagination. Hewitt said some parts of the tour would be off the record, but he wanted me to see the whole process. Before we could see the plants, though, we had to don lab coats, put booties over our shoes and caps over our hair. Nothing is grown from seed, which means plants are cloned from other plants. We started where that process begins — with the mother stock in what’s called the mom room. Dozens of plants stood under LED lights. Cultivation manager Casey Berg said the moms last four to six months. No worries about menopause. To make the next generation, branches from the moms are cut and put in soil, something similar to what a home gardener might do. But Berg watches over hundreds if not thousands (Hewitt declined to give the number) of plants that are the basis for the whole operation. Once a cutting is put into soil, it’s put under a dome to control humidity until the plant takes root and is strong enough to be potted. The process can take four weeks. A plant spends another four weeks in the vegetation room until it’s moved to the bloom room. Every plant gets a barcode and other identifiers so it can be tracked even after it’s made into a product. “God forbid if we ever have a product recall, we’re able to go right back to the mom strain and identify where it came from,” Hewitt said. Columbia Care grows hundreds of strains across the nation based on individual state regulations and the company’s research on the role of medical cannabis. In New York, Columbia Care primarily grows two strains. One strain has a high content of THC, which can be used to relieve pain. The other has a high content of CBD (cannabidiol), which can be used against inflammation. They are combined into vapes, tablets and tinctures in different ratios to treat different conditions. The strains are kept separate throughout the process, even in the bloom room where they stay eight to 10 weeks until harvest. Columbia Care has multiple bloom rooms. I wanted sunglasses when we walked into this one. Squinting until my eyes adjusted, I saw that most of the plants were of uniform height and deep green. Large fans throughout the room created a breeze to keep the leaves moving, and here the scent was cleaner and more outdoorsy. But it wasn’t like strolling through Highland Park, where I could walk up to a plant and feel whether its leaves were soft or tacky. Hewitt was clear: Don’t touch. Cannabis is a Schedule I drug according to federal law, and I was not certified to handle the plant. I kept my hands to myself, trying to avoid the leaves like they were poison ivy, but the rich green fronds brushed my lab coat as I walked the narrow aisles between the movable metal beds. The bloom room is like a massive greenhouse. Employees were pruning, but these cuttings would not be used for new plants. Instead, they would be destroyed under strict guidelines from the state health department. All the plants are female and there is no sexual reproduction, Berg said. They start to bud after two to three weeks. To get the plants to fully flower, Berg mimics the shorter days of fall by reducing the lighting. Berg reached for a bloom and pointed out the crystals that hold most of the cannabinoid, a compound that the oil and ultimately the medicine comes from. Harvesting the plants is like shucking corn, Hewitt said. Employees wear protective clothing, put on gloves and strip the buds and leaves into a bucket. The leaves have some cannabinoid and will be ground up with the bud. According to state Department of Health regulations, the stalks have to be rendered inert and then thrown out. The buds and whatever leaves come off are put on trays in a drying room. The lighting is subdued, and big racks holding the buds look like something you’d see in a bakery. Instead of the aroma of dough, I got whiffs of what pine tar might smell like. The scent was stronger in the room where the buds are ground into a fine powder. I wanted to grab a handful, feel if it was as fuzzy as it looked or see if it would sift through my fingers like sand on the beach. But it’s illegal and I’m a law-abiding citizen. Besides, cameras are everywhere and security guards are burly ex-football players. The next step is to extract the oil from that powder. James Kingsley, dressed in scrubs and looking like he’d be at home in a hospital, runs the extraction process, which uses carbon dioxide at very high pressure to squeeze out the oil. There’s more to do before the oil can be made into a vape, tablet or tincture. Hewitt compared this step to cooking ground beef. Even if you drain the fat, you’ll get some sludge after it’s been in the fridge. In the case of cannabis oil, that congealed substance is called wax. Chemist Zulema Melchor runs a process that leaches and filters out the wax. The apparatus where this happens had a rusty brownish stain. She also tests for potency and how long it takes before the oil degrades. 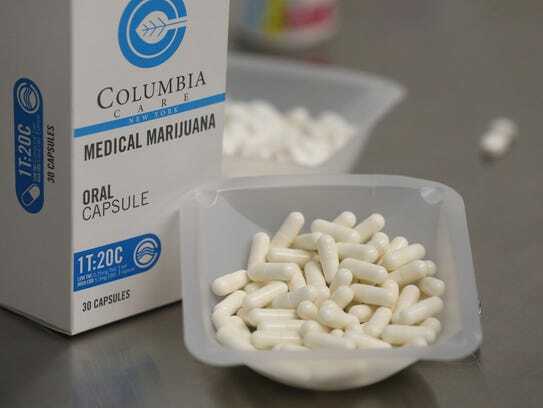 Columbia Care started dispensing medical marijuana in January 2016. Hewitt said the company has less than 200 employees statewide, but he did not give the figure for the dispensary and the manufacturing sites in Rochester. Berg was among the first. The 29-year-old has a bachelor’s degree in plant science from Rutgers. I asked him if he had the job everyone wants. If the 450 applicants for a packaging job are any indication, Columbia Care is a popular place to work. But the company is picky. Columbia Care has several graduates from the University of Rochester and Rochester Institute of Technology. Every prospective employee undergoes a background check that includes their social media history and running their fingerprints through law enforcement databases. Once hired, employees get extensive job, safety and security training. Despite working in what seems like lockdown, employees are free to talk about what they do. Hewitt said when someone asks what he does and he tells them, “I don’t hear, ‘Are you in the stoner building?’ ” Instead, he said he gets questions about whether medical marijuana would work for their mom with dementia. Think of chefs combining ingredients into the perfect recipe that turns out exactly the same time and again. The chemists at Columbia Care do pretty much the same thing. Samples of each lot are tested by the state to make sure they conform to standards of purity and potency. To make tablets, for example, the chemist would determine the proper amount of THC and CBD for the ratio being created, add filler material to create a powder and put the mixture into a hopper that feeds into die cavities on a rotating table. As the table spins, force is applied to each cavity to form the tablets. While much of the process is high-tech with lots of moving parts, some of it remains labor intensive. Tincture bottles are filled by squirting the liquid through a hand-held pipette. Package cartons are glued one at a time. Each product is made in the same sterile area, so the line has to be cleaned between batches. Twice in 2017, the state health department changed regulations — first adding chronic pain to the list of conditions that could be treated and then letting companies make topicals, dissolvable lozenges and nonsmokable ground-plant material. Hewitt said the company spent 2017 refining its processes and bulking up inventory of oil for all its products. Instead of batches of 2,000, it’s now making lots in the tens of thousands. I stood in the secure vault that would stymie Superman and saw the plastic totes full of products that are transported under strict chain of custody to the dispensaries. Hewitt declined to provide the number of Columbia Care clients but said growth has been in proportion to increased demand statewide. As of May 8, there were 54,256 people certified by 1,615 practitioners to use medical marijuana, according to the Department of Health website. Hewitt said the average age of Columbia Care customers is 54, and the gender mix is about 50-50. Columbia Care used to do everything in four rooms. 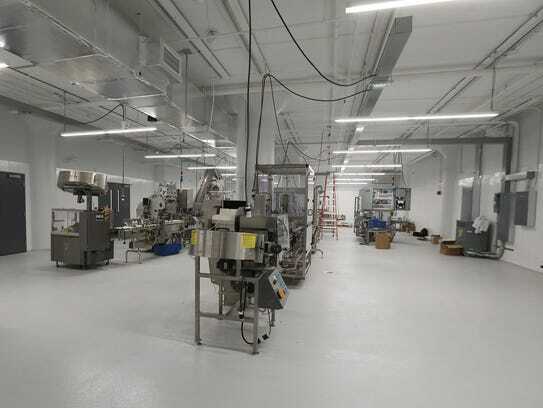 To keep up with demand, the cultivation and processing operations are expanding into 48,000 of the 253,000 total square feet available in Building 12. The increased elbow room includes separate areas for different products, so multiple lines can be made at once. He also said that by the end of the year, filling tinctures will be fully automated. As of the past week, the process to fold and glue the boxes became automated. Hewitt said the company’s goal is to be able to act like any other pharmaceutical company if the federal government someday relaxes rules around marijuana. I asked Hewitt if Columbia Care were getting ready for New York to legalize recreational marijuana, as some of its neighbors are doing.